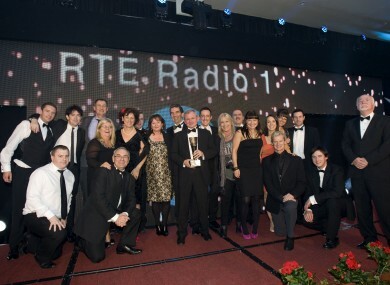 RTÉ RADIO 1 and Today FM led the winners at last night’s PPI Radio Awards 2012, showcasing the best radio broadcasting in the country. Both stations took six awards, with Radio 1 winning the night’s top prize for Full Service Station of the Year, as well as the awards for best news programme for Morning Ireland and best documentary programme for Doc on One. The former’s host Aine Lawlor won News Broadcaster of the Year, while Liveline’s show on ‘The Cost of a Life’ was named best interactive speech programme. Patrick Mason’s drama, ‘The Dreaming of Roger Casement’, won best drama. Today FM;s awards included best breakfast programme for Ian Dempsey, best news bulletin, and news reporter of the year for political correspondent Justin McCarthy. There were also gongs for weeknight host Paul McLoone, who won the specialist music broadcaster award; The Last Word with Matt Cooper, which was awarded for its entertainment inserts, and the Ray D’Arcy Show which was presented with an innovation award for organising ‘The Rocky Road to Poland’, the theme song for the Irish team at Euro 2012. Today FM’s Communicorp sister station Newstalk took three awards, for best speech-driven programme (‘Moncrieff’), specialist speech programme (‘Futureproof’ with Jonathan McCrea) and for sports broadcaster of the year (for Eoin McDevitt of ‘Off The Ball’). BBC Radio Ulster also took three awards, with The Stephen Nolan Show taking the prize for best current affairs programme, while its host also won the prize for best speech broadcaster. Michael McNamee’s documentary on international footballers switching allegiance between Northern Ireland and the Republic, ‘Does The Cap Fit?’, was named best sports programme. 98FM’s Dermot Whelan took two awards, with the Dermot & Dave Show named best general music programme, while Whelan individually won music broadcaster of the year (his co-host, Dave Moore, came third in that category). Mayo’s Midwest Radio also took two prizes, for best sports story – for a piece on Geesala professional boxer Henry Coyle, the current WBF Light Middleweight champion – and the best specialised music show for The Mid-Morning Show. Waterford’s WLRFM was named best local station of the year, while FM104 was named best music station. There were awards for 16 stations overall, with other winners including Classic Hits 4FM, iRadio, KCLR 96FM, Limerick’s Live 95FM, Midlands 103, Cork’s Red FM, Lyric FM and Raidió na Gaeltachta. Broadcasters Gerry Ryan, Seán Bán Breathnach, Candy Devine and Ronan O’Rahilly were inducted into the PPI Hall of Fame. The awards were held at the Lyrath Estate hotel in Co Kilkenny. Email “RTÉ Radio 1, Today FM lead winners at national PPI radio awards”. Feedback on “RTÉ Radio 1, Today FM lead winners at national PPI radio awards”.